Getting rid of unwanted concrete from your site is no easy task. For a stress-free solution at an affordable price talk to the experts at Green Demolishing. We are the trusted specialists when it comes to concrete demolition in Melbourne, and as the name suggests, we will dispose of all concrete and other waste material in a safe and environmentally responsible manner. We offer concrete demolition and removal services for residential, commercial, civil and industrial projects. Our reputation for 5 -tar customer service is reflected in testimonials from customers we have worked with on projects across Victoria. We’re proud to guarantee all our services and to do so at a competitive price. In fact, we will match all written quotations so you can be confident that when you choose Green Demolishing for your next project you are getting great service and exceptional value. We provide a full range of demolition services as well as excavations and bin hire. We work with owner renovators, builders, landscapers and other contractors to remove existing structures or clean up worksites. 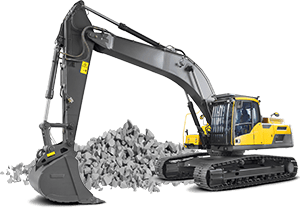 Our team are trusted professionals because of their commitment to get the job done on time and to leave each site clear of waste so that the next stage of construction can begin. With the right equipment and know-how our team tackle diverse projects large and small. We will carry out demolition work in residential areas without disturbing the neighbours. We also complete demolition and excavation on large industrial sites. Looking for a reliable concrete demolition service in Melbourne? Call Green Demolishing today on (03) 9804 8597 to inquire about our environmentally friendly services. The Green Demolishing team were very knowledgeable and professional individuals. The project was completed in just three days and was handled very efficiently with no complications. It has been less than a month since the demolition of my house and my neighbours continually pass on their praise of your professional work. My builder also complimented you on your professional approach, easy-to-deal-with attitude, and how the site was left clean and tidy which enabled him to start building without any issues. Thanks Adam. I would like to thank you, Zeed and your team for everything. We are delighted with how it all went and were astounded by how considerate you all were. We would be happy to provide you with a reference if you would ever like it in the future. Green Demolishing demolished a residential building in Malvern East, Melbourne for our building company. We were very pleased with the demolition works and we would be happy to recommend Green Demolishing to anyone searching for a demolition contractor. We have worked with Green Demolishing on various projects throughout Melbourne. We couldn’t be happier with the work, from demolition and earthworks right through to bin hire even. We are sure to be working with them for the foreseeable future, we really appreciate their green and sustainable approach.